Gardeners, I am telling you, this is the most rewarding crop you will ever plant in your garden. 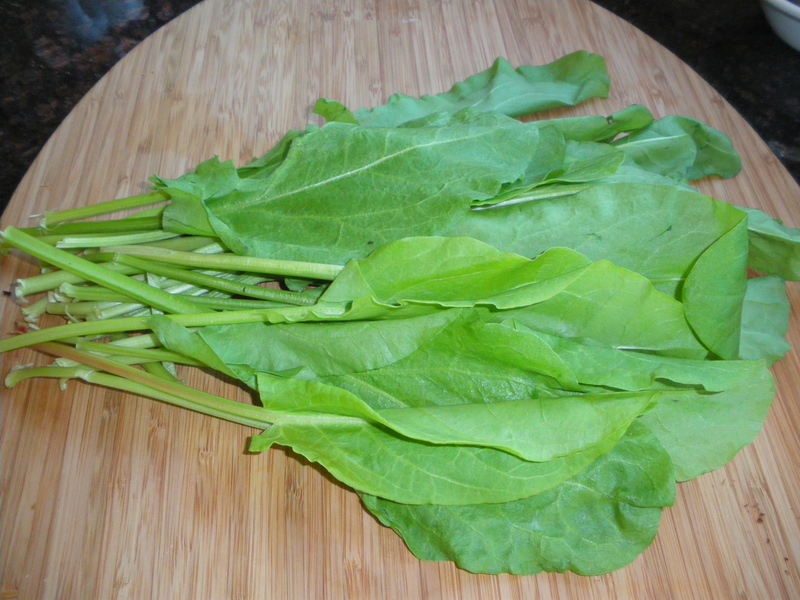 Sorrel looks likes a bit like lettuce, a bit like spinach, grows easily, and is the tastiest vegetable. It can be added to sauces in small amounts and that’s I do when I have to buy it. For some reason, it is always overpriced at the store and that’s if you can even find it. Now, if you have your own garden, or if a friend offers a bag full of sorrel to you, here is what I do, very much like my other grand-mother used to do. Mémé Marie-Louise had a big garden in Aix-les-Bains in the Savoie region after she retired, and that is where I would spend all the school vacations. Gather a bag full of sorrel (bribe if you have too). Clean it under cold running water, then soak it in very cold water for at least an hour, drain and do it again. The soaking is essential to remove some of the acidity. Fill your largest stock pot with water, salt, and bring it to a boil. Cook the sorrel until tender, the time will very much vary whether you have grown yourself or bought it. There are different species around. As soon as it is done, drain, rinse again, drain. It is like spinach, there is not that much left but that is vegetable gold (except that it is green!). Warm it up on low with butter only. Serve with croutons and boiled eggs. Croutons: Cut thin slices of baguette. Brown them on low heat in a frying pan with butter and a tsp of olive oil. The olive oil will prevent the butter from burning. Tip: Spinach and beet greens can be prepared the same way, no extra-rinse required. There is usually sorrel from Vantreight farms for sale at the Root Cellar in Victoria for $1.99 bunch this week. Incredible taste, incredible price! ( so high). This fall, I have been able to buy really nice sorrel at the bulk store “ For Good Measure” by Peppers on Cadboro Bay. They are so nice, I was able to convince them to special order a larger quantity. 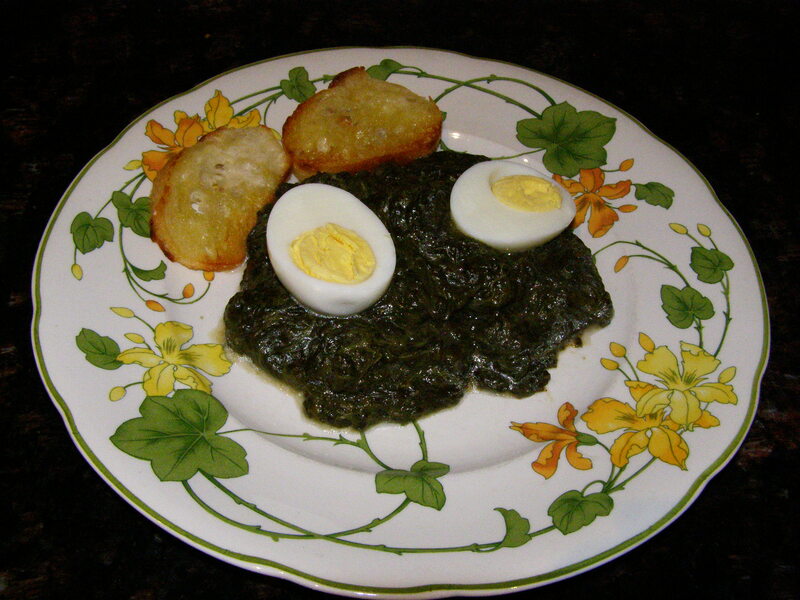 In any case, you can also mix the sorrel with fresh spinach, and you will have a two-tone green vegetable as the spinach remains “spinach green”, while the sorrel turns yellow green as it cooks. This entry was posted in Vegetables and tagged food, for good measure, oseille, recipe, recipes, sorrel. Bookmark the permalink. 4 Responses to Sorrel not spinach! Can’t remember ever seeing sorrel in a store either….I always thought of it as a wild west weed! I think you are proving that almost anything is edible given the right loving care and preparation. You may have to ask at the farmer’s market…They should have it, sorrel is edible and also one of the best tastes. Got to be healthy too, so dark green! Thanks for your input everyone. Standard response from farmers markets : don’t carry it because it does not sell. People don’t know what to do with it. I want it to make ‘white borscht’ – have used spinach through the years because sorrel is not to be found. Two years ago visiting my son in DC found it in Arlington Farmer’s Market by chance – enough for a delicious cold soup. The older generation from Russia brought it with them. It brought back wonderful flavor memories of my childhood(now 80). Using spinach instead-with lots of lemon juice tastes very different – not as refreshing. I see now that growing myself is the answer -maybe still can this season . But definitely will next May-June. that looks so good to me, would love to have some for my lunch right now. Must look for sorrel in the store, can’t remember ever seeing it.